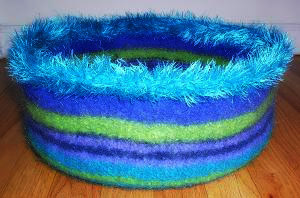 Here are two different tutorials for knitting a pet bed for a cat or small dog. I suppose if you know how to alter patterns, you could knit a big bed for a large dog too. I just love that people take the time to make these tutorials and are happy to share their patterns. Very generous! The KittyPi bed is knitted and then felted. This makes a great, durable bed that’s shaped like a flat-bottomed bowl. The felting gives it some structure, but it’s still soft and comfy. Love it! Don’t miss the two page gallery of beds people have made—lots of inspiration. The pattern is from Wendy at WendyKnits and since she’s generously shared this pattern, I want to let you know she has written two books—Wendy Knits: My Never-Ending Adventures In Yarn and Socks From The Toe Up. The Dotty Cat Bed pattern is another lovely knitted and felted pet bed. 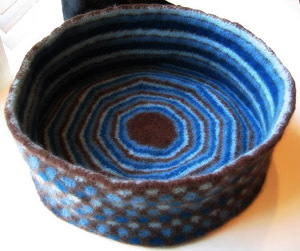 (via craftzine) It has a wonderful polka dot pattern and it too makes a flat-bottomed bowl when it’s felted. Those dots are a nice touch. You can see what the bed looks like before felting. This great pattern is from Kelly over at Kelp!Knits. You can see some of her gorgeous sock patterns too—Interlocking Leaves, Oak Leaf, & Hanging Vines. You’ll need to use a natural fiber yarn to get it to felt. Here are a few tutorials on felting, in case you need them: this one covers both hand & machine felting, here is a printable one on machine felting, and another on hand felting.